Trekking in The Natural World of Ba Be is the best way to really get to know a country region, because you are walking on trails that the locals have travelled for years, to go to market, to tend their livestock, to visit their relatives. Only in this way can you gain an insight into the lives of these resilient resourceful villagers. With this new trail, only recently discovered by Mr Linh, you will travel through more remote areas of the Ba Be National Park, experience true jungle, sublime mountain views and idyllic villages of the Tay, the Dao and the Hmong Flower people. You really do go to places that others can’t reach. 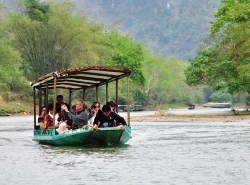 8.00am We leave Hanoi for Ba Be National Park, the biggest natural lake in northern Vietnam. 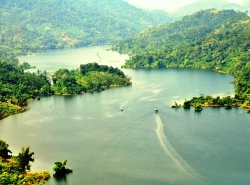 Ba Be Lake is a famous Natural World Heritage Site, also known as ‘Halong Bay in the mountains’. We will stop for refreshment in Thai Nguyen before a quick visit to the Thai Nguyen Museum of Ethnology to learn about the different ethnic minorities in northern Vietnam. We continue to Bac Kan for lunch in a local restaurant. After lunch, we continue to Ba Be and upon arrival to the National Park we take a short boat ride to Bo Lu Village. Tonight we will have dinner and overnight in a stilt house of a local Tay Family. After breakfast at the homestay, we set off for a full day’s hard trekking. We go by car just to the local market atTày ethnic – 7 notable for its complete absence of souvenirs! This is a true local market operating fortnightly. We walk uphill gradually on an easy path taking in more and more views of the rice pad dies and the karst mountain formations and pass through Tày ethnic – 6, Tày ethnic – 5 and Tày ethnic – 4, pretty Tay villages. In an idyllic setting we discover Dao Ethnic – 4, an attractive village of the Dao people and can admire their well ordered vegetable cultivation. Further on, the washing lines and the village ladies burst into colour as we enter the village of the Flower Hmong people. This is such a privilege to see an ethnic group going about their daily tasks in their wonderful traditional dress. Now it is time for serious hiking as we enter the karst mountains covered by thick jungle. We follow tiny trails, sometimes just buffalo trails, surrounded by the tall trees and lush vegetation. The way is rocky, slippery and steep, so not for the faint hearted. However, when we finally emerge we are rewarded by a spectacular view of the little villages and rice paddies below. We make our way down to the valley and we finish the day by walking to the Silk Waterfall where we can wash off the day’s work in the cool water. As a reward, the car will collect us to take us back to Bo Lu Villagefor hot showers, a delicious meal and a well earned rest. After breakfast at the homestay, we take a boat trip across the lake to the Tay fishing village of Tày Ethnic – 2. After visiting the village with its fisherman and local handicrafts, we will travel along an easy trail through gardens and orchards to Tày Ethnic – 2 Village and then to the picturesque village of Ban Tau nestled between the forest and limestone cliffs at the mouth of the Nang river. Lunch is in a traditional village stilt house. 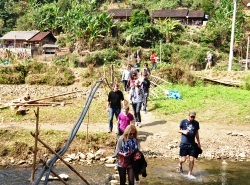 In the afternoon we’ll explore the Dau Dang waterfall before returning to Bo Lu village. Dinner is again at the house of Mr Linh who is certain to keep you entertained! After breakfast at the homestay we take a short boat ride to the National Park Quay where we join our van for the ride back to Hanoi. We will stop at a local restaurant for lunch and should arrive back by late afternoon and you will be ped off at your hotel.